Monday was going to be a busy day, with the open day at the biggest distillery of Islay, Caol Ila and then a trip to the other side of the island for the Port Ellen Maltings open afternoon. 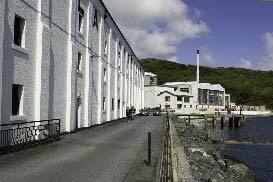 Since its renovation in the 1970s, some locals do not like to go to the Caol Ila anymore, since it lost some of its original character, changing from an artisanal distillery to a large scale automatised plant. Nevertheless, its location on the Sound of Islay with a beautiful view over the Paps of Jura makes it a unique ,like its whisky! Caol Ila on Monday morning, just before the rush. From the distillery, the view other the Paps of Jura was beautiful and the light strong for 9 am. As Caol Ila was the only distillery in Islay I could not visit during my previous stay in 2004, I did not listen much to the comments of the guide and concentrated instead all my efforts on my pictures. 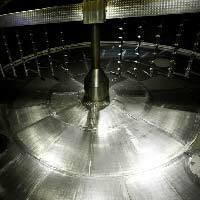 The stainless steel of the mash tun was polished, shiny and clean. Was it especially clean for the open morning? 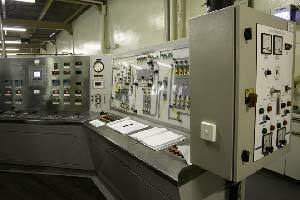 Forget about the traditional craftmanship and the old gauges and welcome to the industrial world of Caol Ila. 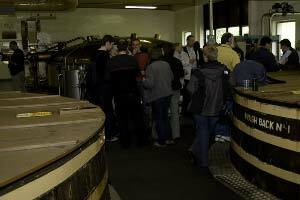 You just need 3 persons to run the distillery! 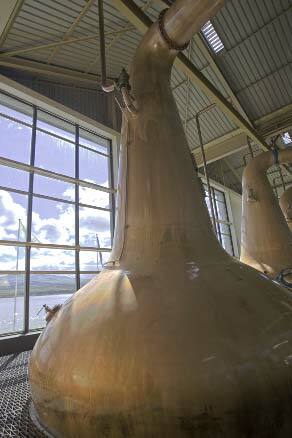 The washbacks of Caol Ila are like the top of an Iceberg: what you see is just the smallest part! Caol Ila is now the flagship of Diageo in Islay and since a few years its whisky has replaced the Lagavulin from the White Horse blend. The distillery is not only producing peated malt for blend or for single malts, but it also produces about 20% (2 months per year) an unpeated malt, called "highland spirit" in reference to the highlands malt. The difference between the "Islay " (peated) and "Highland" new make spirit is quite impressive, the Islay style being with rope and smoke flavours and the Highland style fruity and slightly floral. Once I hope to try some Caol Ila "Highland " style single malt. The view from the still house over Jura is just like a post card: Magic! The tour in Caol Ila turned out to be much more interesting than I had expected and had a very nice "after-tour" with the super friendly staff in a nice and relaxing atmosphere, perfect for a good dram and good memories!